Update 6/17/15: Congratulations to Sherri! Sherri is the grand prize winner of the brand new Amerisleep Revere mattress. 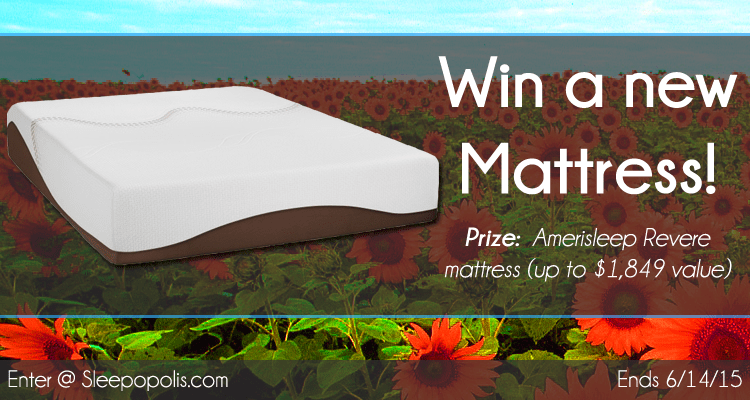 Entering to win a brand new Amerisleep mattress is super easy and takes less than 30 seconds! Enter up to 13 times for extra chances to win. Wishing you could get a new mattress? What better way to score some better sleep than by winning one! We’re giving away one (1) brand new Amerisleep Revere mattress. The Revere is Amerisleep’s most popular mattress. It uses advanced memory foam to offer a comfortable night’s sleep that’s ideal for most sleepers. Prize: One (1) Amerisleep Revere mattress (valued up to $1,849). One (1) winner will be chosen. You’ll be able to select any size Amerisleep Revere mattress (Twin, Twin XL, Full, Queen, King, California King, or Split King). Entries: You may enter up to 15 times, one for each entry method defined above. Only entries verified through the Gleam voting widget above will be counted. Winner: One (1) winner will be randomly selected based on the pool of entries at the conclusion of the giveaway. The winner will be contacted by no later than 6/16/2015. Winners must provide a US mailing address, email address, and phone number to be able to claim their prize. Eligibility: US residents within the continental US (excludes Alaska & Hawaii). Cheating: Voting manipulation and spam attempts will automatically be invalidated. Engaging in voting manipulation attempts may result in disqualification at the sole discretion of Sleepopolis. Amerisleep is one of the most advanced memory foam mattresses I’ve slept on. They use advanced construction techniques to create highly responsive, supportive, and comfortable foams. During manufacturing their memory foams go through a process called “reticulation”. This process blows out the cellular structure of the foam, dramatically improving the breathability and cooling. Amerisleep is one of the coolest and most comfortable memory foams I have ever slept on. I love Win Our Bed is over 8 yrs old hubby has health issue the bed is just what use be like him we just don’t have any $$$ I wish be great I enter all time maybe will be..we know everyone be happy to win Amerisleep mattress. How are you supposed to submit a photo? I have one. I named it #amerisleep. Is there somewhere to upload it? The pictures should be uploaded to Instagram and tagged #Amerisleep. Then click the button and it will verify. Would love this mattered sounds heavenly! I’ve been looking at purchasing a new mattress, and would love to wake up and feel refreshed in the morning! I came across your website which has been very informative and helpful, and want to say thank you for this. Plus you’re giving away a new mattress, how awesome is that. You’re very welcome, Lori. I’m glad you’ve found my site to be helpful! Best of luck to you in the giveaway. Could use a good mattress for my son. Oh how good it would feel to have a good night’s sleep!! My mattress set is 14 years old and it would be great if I won these!! I’m dreaming about this mattress…. This would just have to be the contest that I am hoping/praying to win. FaceBook just seemed to bring me to your website. I had entered a giveaway for a Mother’s Day mattress giveaway. It was already over and the winner notified. I need a new mattress so much. It has been over 20 years since we purchased a new mattress. I have had 3 discs removed from my neck. I am now having lower back issues with my Sciatica Nerves on both sides which of course runs from the lower back down the back if both legs all the way to my feet. The doctors have already told me that I need a very firm mattress. I can not even seeing in my future to he able to buy a mattress. My 58th birthday will be on Tuesday, June 9th, 2015. I have researched your products and it sounds just like what I need so much!! Please !!! Still hoping to win a mattress. We need several but would be so thankful to win one!! Stay tuned for future giveaways! Spoiler Alert: I’ll have a new giveaway starting within the next few weeks here. My 91 year old mom is in constant 24/7 pain. All her bones ache, has arthritis so bad she only goes out to the doctors. she spend most of her time in bed, bad rotor cuff which wakes her up complaining. She sure can use this Mattress. Thanks for the chance to win one since she can not afford one. What a great mattress….and needed here! Currently have broken fibula and previously had a discectomy. Thanks for bringing this mattress to my attention and having a sweepstakes. Oh I so need a big comfortable long sleep !!! Sleeping on a foldup bed, need mattress badly! I was wondering how we would ever afford a new mattress at today’s prices! I have a problem laying flat due to a neck fusion. Plus I get so dang hot during the night to the point I have to change clothes. There needs to be a bed that has A/C. Thanks for this opportunity! If I won it would go to my 10 y/o son who would so appreciate a new mattress. Moving and need a new mattress. Bring it … can use it … definitely need it!! I have been sleeping on my couch and could so use this mattress. I love how it is a breathable foam so you don’t over heat also. Thanks for sharing. whats the deal?..it will not let me follow amerisleep in instagram….why? Hi Keyll – Try logging out and back in again of both Instagram and Gleam. That should reset it. Also, double check to make sure you’re not already following Amerisleep. I have always been weary of foam mattresses due to how hot they would sleep when they first came out. But its time for a new mattress and I am curious to see how they have advanced in firmness and temperature control. Thanks for the informative reviews helping people navigate through the myriad of options. My body could use a mattress like this. Oh to get a good nights sleep would be terrific.